The 2019 National Conference & Fellowship Awards Gala brings together seasoned directors, executives and industry leaders for two days of thought leadership, networking and celebration. 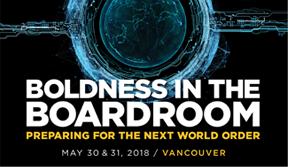 Join us as we examine emerging boardroom issues and deliver dynamic learning, dialogue and cutting-edge insight for Directors. The theme of this year’s conference, Changing Our Minds, Changing Our Boardrooms: Rethinking Trade, Technology, Talent and Transformation highlights the importance for boards to adapt, respond and transform themselves as a result of changes impacting their competitive environment, the use of technologies and an unpredictable climate of trade and capital flows. We invite you to be a part of this important dialogue by attending one of Canada’s most influential business and governance events. We will also celebrate excellence in directorship and honour the accomplishments of this year’s Fellows at the 2019 Fellowship Awards Gala on June 6, 2019.